That’s two ones, three commas and a whole lot of zeroes, and it’s how much Boston paid for the Big Dig, over and above the $2.2 billion cost estimate tossed around during horse trading among the Reagan administration, Congress and aides to then-Massachusetts Gov. Michael Dukakis to fund the highway megaproject. That cost overrun equals the city’s entire 2008 budget, plus the combined player salaries of the Red Sox, Celtics, Bruins and Patriots — with enough left over to buy Toyota Priuses for all 400,000 working-age Bostonians. Instead, the Cradle of Liberty received an overdue, underground, eight-lane highway tunnel; shoddy workmanship; one death; and an unprecedented $14.6 billion total price tag, which includes more than $1 billion in inflation over the two decades of the project. Much of that money came from Joe Taxpayer: The federal government contributed more than $8 billion to the project, officially called the Central Artery/Tunnel, which replaced an ancient, overcrowded, elevated highway that split downtown Boston. And despite its massive costs and errors, the Big Dig is typical of publicly financed megaprojects — that is, the public transit systems, opera houses, stadiums and other infrastructure undertakings that cost more than $1 billion to build. All over the world, officials offer starry-eyed promises to sell such projects to the public, but reality arrives years later in the form of outlandish expenditures and systems that fail to provide the benefits on which they were premised. Six time zones removed from Massachusetts, in the 1,000-year-old Danish city of Aalborg, professor Bent Flyvbjerg believes he’s found the way to take the doggle out of multibillion-dollar boondoggles. Adapted from Nobel Prize-winning research by American economists, the Flyvbjerg (pronounced “FLIU-bee-yah”) approach rests on close analysis of the history of similar, completed megaprojects. The strategy may seem obvious, but it could save billions of dollars by avoiding unworthy projects and restraining spending on those that proceed. Already, the United Kingdom and the Netherlands have hired Flyvbjerg or adopted his methods. In the U.S., the ideas are also gaining traction: Federal Transit Administrator James Simpson name-checked Flyvbjerg in a June speech, lauding his research into managing megaproject risk management and accountability. “That’s exactly where we’re headed,” Simpson said. But few left-leaning urban planners or conservative taxpayer advocates want to follow Flyvbjerg’s path to get there. During the late 1980s, Flyvbjerg was sitting in his father’s living room one evening, watching the news. The television anchor described Denmark’s first megaproject, the 8-kilometer (4.9-mile) Great Belt tunnel, the second-longest underwater rail tunnel in Europe, part of a new road and rail link stretching to Sweden. The government-hired engineering team, though, had never attempted anything like it. Then a junior professor researching urban transit systems, Flyvbjerg considered the suggestion for a moment and then filed it away. In 1991, the tunnel flooded. Two years later, parts of it caught fire. The government eventually called in experts from other countries and replaced the tunnel management team. By the time it opened in 1997, construction costs had doubled. Flyvbjerg thought back to his father’s comment, wondering: Is this just a fluke? Are we dumb in Denmark or just unlucky — or is this something that happens often? He searched the academic literature for studies of the size, frequency or reasons for cost overruns on similarly massive projects but discovered surprisingly little. During the last 20 years, Flyvbjerg has begun to fill that void. Grandiose infrastructure projects have accompanied the rise of civilization, from Egypt’s pyramids to Rome’s aqueducts to Teddy Roosevelt’s Panama Canal. Beginning with the industrial revolution, though, rail systems, sports stadiums and other projects were often built with private money. In the U.S., the end of World War II brought the first government-funded megaproject boom, with the birth of a federal interstate highway system and many of today’s major airports, according to the definitive recent history Mega-Projects by Alan Altshuler and David Luberoff. The rise of environmentalism and activism in general in the 1960s slowed the process of political approval and implementation of major construction projects. But building boomed again in the 1980s, as cities invested in quality-of-life infrastructure like convention centers and local transit to lure homebuyers and corporate investors. Recently, megaproject construction has exploded, fueled by rapid economic growth in the developing world. In preparation for the Beijing Olympics, for instance, China will invest more than $23 billion constructing venues, highways and other projects. More than $1 trillion worth of development is under way in the oil-rich Persian Gulf, including Dubailand, a 3-billion-square-foot, $100 billion-plus entertainment complex to include about a dozen amusement parks and full-size replicas of monuments like the pyramids of Giza. Consulting firm KPMG predicts that basic infrastructure spending will account for as much as 6 percent of world gross domestic product — or $30 trillion — during the next quarter-century. The American Society of Civil Engineers claims such investments in the U.S. alone could reach $1.6 trillion between 2006 and 2010. Unfortunately, Flyvbjerg says, much of that money will fund projects that wind up costing billions more than predicted, in some cases building rail systems, highways, convention centers and other public works that should never have gotten a green light at all. A decade later, by collecting data from 20 nations on five continents, Flyvbjerg had produced the first statistically significant analysis to show what Pickrell had argued with case studies: The vast majority of public works projects go drastically over budget and aren’t as well patronized as proponents claim. He also found that modelers didn’t seem to be improving their estimates over time; the scale of overruns remained relatively constant. Rail and highway projects are often the worst boondoggles, and they form the bulk of Flyvbjerg’s research. But other researchers have found dangerous overoptimism in all kinds of megaprojects. Denver International Airport, for instance, opened in 1995 at a cost of $5 billion — almost three times as much as originally predicted — and at one point, rating agencies downgraded its bonds to junk status. When cities built convention centers as supposed economic development engines during the 1980s and ’90s, many claimed visitors would pump money into the local economy by shopping and staying in hotels. They predicted hotel stays of three nights per conference attendee, but the actual average was often just a single night. New York City’s huge Javits Center attracted fewer than 0.2 hotel room nights per visitor, according to an analysis by University of Texas, San Antonio professor Heywood Sanders. Analogous studies unearthed similar problems in projects ranging from concert halls to spy satellites. The bang they produced was not as loud as initially advertised, and the bucks they cost exceeded original estimates — often by several hundred percent. “The phenomenon he cites is irrefutable,” said the RAND Corporation’s Martin Wachs, who previously was a planning professor at the University of California, Los Angeles, where he advised Flyvbjerg on his doctoral dissertation. Few in the field question the existence of faulty cost and need estimates for public works projects. But the experts fight bitterly over the causes for the consistently inaccurate projections and how to address them. Flyvbjerg’s opinions on the subject can be distilled to a single theme: The politicians are lying to us. The conflict between the rationality of hard numbers and the irrationality of public officials permeates the papers he writes on megaprojects. It’s the lens through which he seems to view almost everything, coloring even the memory of his first exposure to the workings of the public sector, while a lowly student intern at the planning authority for the Ribe County Council in Denmark. That summer, the young Flyvbjerg explored the pros and cons of focusing development in the county’s urban centers versus concentrating on smaller towns. In one draft report, he described a British study showing that children performed better academically when they lived closer to the school — highlighting the value of decentralized school systems with facilities nearer to families’ homes. When the report returned from review by higher-ups, Flyvbjerg noticed the section on the school study was crossed out. A note in the margin read, “Cancel, may not apply in Denmark,” next to the initials of the county director of schools. Flyvbjerg spotted a pattern in the rest of the director’s notations: He’d cut out all information that supported decentralizing schools. The administration had apparently arrived at a decision, and the Regional Planning Authority was not to interfere. “In reality,” Flyvbjerg later wrote of the episode, “power often ignores or designs knowledge at its convenience.” It’s difficult to read Flyvbjerg’s papers without thinking back to this idealistic, frustrated university student, whose research was dismissed by an immovable political authority. Megaprojects are often born of good intentions but end as abject failures. Those who track them see different sources of error along the way, and those mistakes suggest different solutions. The typical birthing process goes something like this: A list of transportation-related proposals makes its way to the mayor’s desk. The mayor and city council choose a handful of proposals that seem promising. Maybe they’ll reduce downtown traffic; maybe they’ll please business leaders by easing the commute; maybe they’re vanity projects that will allow the mayor to put his stamp on the city. The city hires a consulting firm to draw up projections. The mayor picks the most promising and asks for more detailed plans. He calls a press conference, perhaps touting a figure based on rosy assumptions and little data, and then puts the project up for a referendum vote. The city and state apply for federal funding to ease the financial burden, and bids are taken from builders. Ten years later, when the project opens, the numbers from that first press conference and the actual cost and performance have very little in common. The traditional solution for this disparity between initial projections and actual results is technical: If the government and its contractors can just do a better job of planning for what might go wrong, early estimates and later reality will eventually converge. On most projects, experts called cost engineers make the predictions. Although the estimating techniques are math-heavy, the basic version involves adding up costs as if a megaproject were an expensive, intricate cake recipe: the number of cubic yards of concrete that will be required, multiplied by the price of a cubic yard of concrete, plus the price of labor to lay down the concrete, and so on. Yet some costs are tough to model upfront, such as reaching mitigation agreements with political groups that hope to minimize the environmental or other damage caused by a project. The Big Dig, for instance, arrived at more than 1,500 separate mitigation agreements, accounting for at least one-third of its costs. On transportation projects, modeling for increases in usage hasn’t changed much since the 1950s: Planners estimate the number of trips people take, distribute them among origins and destinations, divide them according to travel and assign them to highway or transit networks. The software most cities use doesn’t account for people who bike or walk to work or who alter travel behavior due to unreliable systems. That’s partly because government funding for improving modeling programs dropped from $15 million during the 1980s to less than $3 million today out of a $40 billion transportation improvement budget, according to a 2007 report by the Transportation Research Board, a sister agency of the National Academy of Sciences. Flyvbjerg doesn’t deny that technical changes in the estimating process could make it more accurate. But if the problem was primarily in the estimating technique, he says, you’d expect projections of demand and cost to be wrong but in a random way, sometimes way too high, sometimes way too low. But that’s not what happens. Though a small number of public megaprojects, such as the Brooklyn Battery Tunnel, come in on time and on budget, the average large project finishes at a cost well above projections. Ridership estimates on transit systems are frequently too high. Almost never does a project cost far less than initially projected. Flyvbjerg and his cohorts think something else must be pushing errors toward the high edge of the probability bell curve. During the early 1980s, around the time Flyvbjerg was a UCLA visiting scholar, Wachs, then a professor at the university, was interviewing alumni of his planning courses, looking for reasons why estimates might be persistently wrong in one direction. Once they entered the “real” world, former students told him, the rules of forecasting they’d learned in college no longer applied. Many had been told to fudge numbers to support political goals. “The people I encountered had resigned their jobs in tears and said, ‘I can’t be a planner; this is horrible,’” Wachs remembers. Flyvbjerg later conducted his own study of transportation officials in the United Kingdom. As they described it, if they didn’t underestimate costs, their projects wouldn’t get funded. P. Anthony Brinkman, another former Wachs advisee who now teaches at the University of Nevada, Reno, went even further, crisscrossing the country for hourslong interviews with 30 planners and modelers for a 2003 dissertation. “In my professional experience, every one of the plans to which I’ve been a party had a political spin,” one consultant told him. As Flyvbjerg views it, the economic incentives for large public construction projects are completely out of whack. Local officials predict low costs and big benefits to persuade skeptical citizens and to compete with other local governments seeking federal funds. Flyvbjerg calls the result survival of the unfittest: Instead of approving the best projects, officials end up funding those that look best on paper. And by the time accurate figures rear their ugly head — and megaprojects routinely last longer than a decade, from conception to completion — the officials who launched them are long gone from office. In this environment, planners and consultants are apt to tell clients and bosses what they want to hear or risk losing jobs or contracts. On multibillion-dollar projects, all sorts of assumptions must be made — such as inflation rates or materials costs — and small differences in choice can significantly bias results. Officially, the process is transparent, but there are few attempts to verify the cost estimates and usage figures put forward at the start of a major project. “You could do a Freedom of Information Act request and get the information, but in practice, that’s hard. And you’d have to have software to run the code, and it’s a huge amount of data,” says David Levinson, chair of transportation engineering at the University of Minnesota. Flyvbjerg suggests that two dynamics underpin the horribly inaccurate estimates for most megaprojects: Either politicians, planners and consultants are lying outright to get the projects funded, or they’re guilty of “optimism bias,” succumbing to the psychological tendency to overestimate the likelihood of positive events. It may seem a pessimistic assessment, but Flybjerg stands by what he’s read, seen and heard. Five years ago, Flyvbjerg received an e-mail from the editor of the Harvard Business Review. The journal was publishing a paper co-authored by Daniel Kahneman, a Nobel Prize-winning Princeton economist, and the editor wondered if Flyvbjerg might like to add a commentary. At first glance, the article seemed to have nothing to do with infrastructure projects: Kahneman and Australian Graduate School of Management lecturer Dan Lovallo were offering a technique to help executives make better decisions on, for example, building a factory or acquiring a rival business. Yet chief executive officers and megaproject-proposing politicians have much in common. CEOs have a simple goal: increasing revenue and cutting costs. As Kahneman and Lovallo argued, managers often take the “inside view” — focusing tightly on the case at hand and extrapolating from current trends. Decisions from this perspective fall victim to an inherent positive bias toward how well new initiatives will proceed; the bosses almost always think they can bring their projects in quickly and cheaply. The authors recommended what they called the “outside view” — examining the history of similar actions. This technique, first described by Kahneman and Amos Tversky in 1979, was called reference-class forecasting. Flyvbjerg was then focused on strategic misrepresentation — a euphemism for “lying” — by megaproject managers, and the Review editor wanted him to compare that phenomenon with Kahneman’s notions of optimism bias among CEOs who believed their brilliance and management acumen would make projects run smoothly. It was not Kahneman’s diagnosis but his potential solution of reference-class forecasting that struck Flyvbjerg. The inside view seemed analogous to the cost-engineering method of breaking down a megaproject into components and then adding up their costs. The outside view might be an antidote. Around the same time, the United Kingdom’s Department for Transport had invited Flyvbjerg to bid for an assignment advising it on megaprojects. Could the outside view help the British control these unwieldy projects? The contract would have taken too much time for Flyvbjerg to complete, without impeding his academic research. So he worked with the Danish engineering firm COWI to adapt the method and create megaproject modeling guidelines for the Department for Transport. The protocol would be deceptively simple: Create a list of projects similar to the one being proposed, or a “reference class”; look at past performance on projects in that class; and create a forecast of the probability of outcomes, from best-case to worst. The DfT and Scottish Executive first used the method for a tram line in Edinburgh in 2004. They compiled a list of 46 projects, forecasting a likely cost of £400 million and a 20 percent risk of overrun. The Department for Transport soon made reference-class forecasting mandatory policy for infrastructure projects larger than £5 million; the U.K. Treasury adopted a similar policy for all transportation projects larger than £40 million. None of the construction projects put under contract through the technique is complete, but the early stages of British road projects in which reference-class forecasting was used are adhering more closely to budget than those using standard cost estimates. The reference-class method, Flyvbjerg says, is the best fact check against the human estimating errors he’s documented, whether intentional or accidental. Consultants who plan megaprojects for process industries — oil rigs, chemical refineries and the like — say Flyvbjerg’s big-picture technique for estimating the cost and use of a project falls short of a true fix because it doesn’t emphasize detail-oriented project management. Many employ benchmarking techniques developed by Ed Merrow, the former RAND researcher and UCLA mathematical economic modeling professor whose research consultancy Independent Project Analysis maintains a database of 14,000 projects. Like Flyvbjerg, cost engineers may benchmark costs on potential projects against previous ones. Yet Merrow and others see the megaprojects problem as a management challenge. “The fundamental problem is these are difficult projects,” Merrow says. “And the difficulty is compounded by the public sector’s enormous ignorance vis-à-vis basic, decent project practice.” The Big Dig’s managers, Merrow says, could have spent at least another $300 million planning — conducting further soil borings, for instance, to understand what was underground. Contractors claimed that underground “surprises” added significantly to the work they had to do, as well as to the project’s cost. Many who support Flyvbjerg’s ideas in principle are skeptical they could work in practice. Stephen Beatty, a partner at KPMG in Canada who manages the firm’s North American infrastructure work, called the reference-class concept “brilliant.” But he expressed concern that reference-class forecasting’s realism about costs might give construction firms license to hit the maximum budget. “If you do a renovation on your house, you know if you told the contractor he still had $50,000 to spend, somehow he’d spend that money,” Beatty says. Others suggest entirely different methods for controlling costs and making sure the right projects receive government backing. The University of Nevada’s Brinkman views the issue as a problem of individual ethics, not institutional shortcomings. Many of the dozens of forecasters he interviewed seem to be engaging in self-deception, unaware that their day-to-day decisions influence political outcomes that matter to citizens. He proposes compulsory ethics training in planning schools, exposing students to project-estimating dilemmas before they enter the working world. Jonathan Richmond, a former Harvard University transportation researcher and now an adviser to the Government of Mauritius, says leaders must change their outlook: Instead of the mentality that public achievement means building something, they should focus on managing existing resources to better serve citizen needs. For example, cities might increase bus frequency instead of building costly rail lines. Richmond is skeptical about new rail lines; others think governments should do their best to stay out of the megaproject business as a whole. 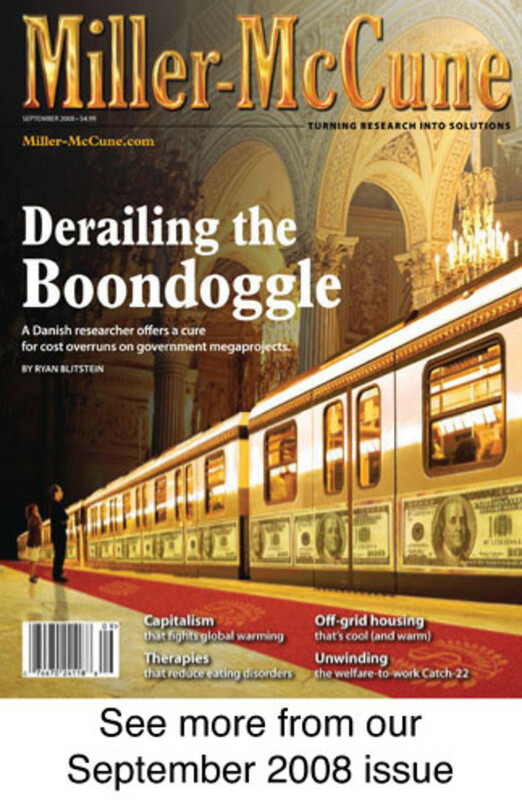 Randal O’Toole, an Oregon-based Cato Institute fellow, an anti-regulation environmentalist and a self-described “anti-planner,” believes a better approach would be to let private companies step in to offer services like transit or entertainment facilities and then regulate those industries. Corporations have had their share of megaproject disasters, though — witness Royal Dutch/Shell’s Sakhalin-2 liquefied natural gas project in Russia, which ran into a $10 billion cost overrun due to increased steel prices, poor weather and the relocation of pipelines to protect endangered whales. Despite the myriad approaches and proposals to the persistent problem of cost overruns, Flyvbjerg remains confident in his megaproject worldview. He revels in the criticisms — when he submits articles for publication, he sometimes asks editors to find especially discriminating article reviewers to spot errors in his arguments and interpretations. When skeptics write letters to the editor, Flyvbjerg fires back replies as long as some researchers’ entire papers. In late 2005, the Dutch government offered Flyvbjerg the chance to act on his ideas. The Netherlands asked him to help decide whether to build the Zuiderzee (“South Sea”) Line, a controversial rail project from Amsterdam’s Schiphol Airport to the city of Groningen in the north. One-third of the 180 kilometers would be upgraded from existing track; Flyvbjerg’s task was predicting the cost of the more expensive remainder, a new set of double tracks that would handle a train travelling 250 kilometers (or 155 miles) per hour. The megaproject seemed ripe for reference-class forecasting. He searched his database for comparable projects. The larger the reference class used in predicting the costs of a project, after all, the more accurate the results. But if he included projects that weren’t governed and funded by institutions similar to the Dutch government, they’d skew the data. Of 84 rail systems, 16 were tossed out because they were built in developing nations or countries, like Japan, that had large cultural and governmental differences from Holland. His team spent a few months examining cost and patronage records and assembled a forecast for the Zuiderzee project. As expected, the Dutch team’s early predictions were overoptimistic. They’d underestimated not just the cost of the Zuiderzee Line but also the risk that they’d go over budget. The government had predicted a construction cost of €4.1 billion (or $6.5 billion), with a 1-in-15 chance of a 20 percent cost overrun. Flyvbjerg’s model expected a €5.7 billion ($9.0 billion) cost, with a 65 percent chance of overrun — and 1-in-3 odds the overrun would be 50 percent higher than the original estimate. Weeks later, members of the Dutch Parliament looked at Flyvbjerg’s revised estimates. They canceled construction of the rail line before even putting it out for bids. If scrapping an inherently wasteful megaproject is the most direct illustration of reference-class forecasting’s power, Flyvbjerg suggests other ways that the method might help governments save. With realistic knowledge about costs, schedule and demand at the outset of a major project, officials won’t have to pause construction to beg the public — or private financiers — for more money, a frequent cause of delay and overruns. Flyvbjerg has calculated one year’s delay adds 4.5 percent to a project’s cost — at the Big Dig level of project, that’s an extra $657 million. Reference-class forecasting also makes it easier for the government to build incentives into a contract, encouraging contractors to complete projects within budget or face penalties if they don’t. England has already put some such incentives in place, requiring local authorities to pay for 50 percent of the cost overrun within the reference-class forecast but 100 percent of the overrun above it. Since his initial work in the U.K., Flyvbjerg has worked hard to publicize his technique, submitting papers to every top journal that will publish him and writing personal letters to the ministers and department heads of the world’s largest countries. More than a few have written back. Even in the U.S., traditionally less planning-oriented than most European countries, reference-class concepts are catching on. The American Planning Association endorsed the forecasting method in 2005, though the organization couldn’t name a U.S.-based project that uses it. And despite strong initial criticism of Flyvbjerg’s research from government and industry, the Federal Transit Administration has renewed its focus on risk and cost, funding just 19 new rail projects in fiscal 2008, compared with 48 in 2001. While the FTA has given no signal it will adopt reference-class forecasting, Flyvbjerg sees that as a likely next step. For now, it’s unclear whether the lower number of funded projects is the result of increased scrutiny or local governments who drop out of the process in frustration with the agency’s bureaucracy, says Jeffrey Zupan, a former director of planning for New Jersey Transit who’s now a senior fellow at New York’s Regional Plan Association. The results of increased focus on cost haven’t appeared yet, either: The FTA-funded extension of the Washington, D.C., Metrorail to Dulles International Airport has suffered a 77 percent cost increase, going from 2004’s estimated cost of $1.52 billion and estimated completion by 2009 to as much as $2.7 billion and completion in 2013, according to a July 2007 agency report. No one disputes that Flyvbjerg has successfully spread his ideas. He can’t track every megaproject that uses reference-class forecasting, but he estimates several dozen have been exposed to it, and at least a handful have had costs curtailed as a result. As he continues to broadcast his views, Flyvbjerg is working to convince more governments to release statistics on completed projects. The more information is open to researchers, the better the forecasts. And the more accurate the predictions, the more likely someone like him will help prevent the next Big Dig disaster. Just the same, Flyvbjerg doesn’t particularly enjoy the spotlight and turns down 90 percent of media opportunities and consulting work that come his way, in favor of concentrating on research. Some in the field, however, see the marketing of his methods as self-promotional to a fault. Even his old adviser Wachs, who supports Flyvbjerg’s scholarship, acknowledges “complicated feelings” about it. “People do pay more attention to his work than to the work of others who have done similar things but haven’t aggressively promoted them,” Wachs says. Flyvbjerg doesn’t see reference-class forecasting as the exclusive solution to the megaproject problem. In fact, he says, he doesn’t “subscribe to the concept of ‘the solution.’ Reality is too dynamic and complex.” He’s open to variants of his techniques and other methods that account for risk, instead of denying it. He sees reference-class forecasting as working in the service of transparency and stronger governance, keeping citizens and decision makers informed instead of misinformed. Ryan Blitstein is a Miller-McCune contributing editor.